Isn’t it amazing that after all the losses, it only takes one good victory to change everyone’s thought process? Admit it, we’ve all felt that way about certain sports players, even other people in our lives. It’s not fair, but this is how life and others treat us, too. Maybe you’re the one going through a string of losses. It seems like one situation after another is not going your way. Why am I having so many challenges at work? Why is there a miscommunication with my family? I’m working my tail off and no one is giving me respect. I’m really getting frustrated and depressed. Ok, we all deal with those situations, but today you’ll turn the corner. Just like in sports, all you need is one victory to change the course. All it takes is the feeling of accomplishment to create the right mindset. These victories can be as small as organizing your office, finishing projects at work, home or school, and possibly doing yard work and cleaning the garage. The short-list is endless according to your lifestyle. You might need to have an adult conversation with someone and come to a mature conclusion. You’ll both feel better — believe me. Once a string of small victories takes place, they’ll snowball into a playoff championship run. Remember, our sports teams don’t start the season in the playoffs. They have to succeed in a certain number of wins to get there. Those teams, just like us, have plenty losses along the way. But, it’s the team that doesn’t let losses keep them down that make it to the championship game. It’s OK for people to doubt you, but never doubt yourself. Today is your comeback day. You’ll be the master of victories and the conqueror of life. Now get out there and kick some. Recently I attended my daughter’s volleyball tournament, and a few of the teams were more highly skilled than others. During the tournament, Daylyn’s team played one of the higher-skilled teams. And quickly, the other team was dominating on the scoreboard. Most of the girls, including Daylyn, were hanging their heads and had the look of defeat even though the game was only half way over. And yes, of course, they got slaughtered. After the game, Daylyn told me she was embarrassed and disappointed with her and the team’s performance. I told her, you will always face stronger opponents in everything you compete in, but don’t let them see you’re mentally defeated. Instead, show your opponents and teammates the look of determination. Show everyone that you might be getting beat on the scoreboard, but you’re still going to out-hustle everyone on the court and give your very best. Now, think about it. We all face challenging situations in our everyday lives. Sometimes, we feel like we’re getting beat up and want to drop our heads and give up. This will only make us feel more disappointed in ourselves. Don’t let your opponents or situations know they are defeating you. Learn to create a game face with grit, determination and fight your way back into the game of life. Just know, Daylyn was in that game situation again, but she had the look of a warrior and battled to the end. If a 15-year-old athlete can learn life lessons, so can you. Now, go look in the mirror, make the scariest game face imaginable, and tell yourself that no one will defeat you again. Take a mental picture and next time you’re feeling defeated, pull out that game face and win the day. From this day forward, defeated is no longer a part of me. This world will only see determination. If you’ve ever played sports or competed in something, besides winning, you’ve experienced the feeling of losing. None of us like losing, but it’s part of life’s lessons that’s important to learn, especially for children. As parents, it’s difficult watching our kids lose competition that’s clearly important to them at that time. My daughter Daylyn just went through a tearful loss of trying to win a position for a club volleyball team. There were hundreds of skilled players competing for only a few positions. She and many other girls were devastated after being cut from the team. This was a moment in which parenting played an important role. We discussed every detail of where she gave full effort, and her possible weaknesses. After going through a brief crying session and realizing there is nothing to be ashamed or embarrassed about, we put to together a new plan to tryout for one last team. First, I worked on her confidence, good sportsmanship and understanding to turn this into a positive learning experience. Then, we targeted weak skills to rebuild courage and determination. On the day of tryouts, Daylyn walked in ready to own and conquer the practice. During the car ride, she visualized already winning a position. My little girl took no prisoners, and played at a whole new level. So you know, she did make the team, but the lessons learned in losing out-weighed any victory she’s ever had. To be a champion, you must learn from losing. In sports or in life, what did you do next? We’ve all witnessed professional basketball players miss baskets and cry to the referee that someone fouled them, while the other team is hustling down the court to score. I told my son Dylan, who plays basketball for his high school team, that eventually someone will block your shot, and the opponent’s crowd will be screaming at you. But, it’s what you do next that will shut them up. It’s up to you to cry foul, or you can out-hustle, steal the ball back, and take another shot. My daughter plays competitive volleyball, and sometimes she misses a block, dig, or has a bad serve. But, it’s what you do next that will determine the proceeding outcome. You can either show teammates a bad attitude or accept it’s part of the game, and make the next big play. Over the past few years, my family uses the phrase, “what did you do next?” in all aspects of life. My kids have faced different levels of bullying and typical teenage drama, but they’ve become accustomed to handling those situations. What about you? Do you have challenging situations at work or home? When something happens to you, what’s your next action or words? Do you confront with professionalism and rationalism, or do you respond with anger and aggression? The later typically only makes the situation worse. Notice, people who stay cool and rational during adverse situations can diffuse problems peacefully. Also, these people typically receive occupational promotions and better life partners. We all face challenges on a daily basis, but it’s how we respond to them that determines our true character. You can’t always control what happens to you, but you can always control how you respond. So, next time you’re playing sports or are in challenging situations, ask yourself, “what do I do next”? I bet you’ll be the better person standing. Back in the 1990s, I was an assistant football coach for La Marque High School. During one of those years, another coach rented a room out of my house. Throughout the whole summer, he refused to go outside during the day. He spent most of his “off-time” on the couch, watching TV, and basically being lazy. All summer, I kept telling him to exercise outside and get acclimatized to the heat. He would laugh at me as he chugged down another liter of soda. Well, the first day of practice started in August, and after about three hours in the sun, two football players had to carry him off the field from heat exhaustion. I just shook my head as I watched him vomiting with wet towels wrapped around his head and neck. Of course, there’s a lesson here, but I’m not going into detail about Texas summer heat common sense. We all have heard numerous times to wear hats and sunblock, stay hydrated, and only exercise outside early or later in the day. Hopefully, you’ve figured that out by now. But, I am telling you to go outside, feel the heat, and make your body sweat. We are human beings and should be a part of nature. How did our grandparents survive the heat? They were in it every day in order to make a living. My dad was a football coach, and starting in June or July, would jog in the heat to prepare for two-a-days. What has happened is we are too caught up with all the indoor lazy activities and entertainment. Our children don’t play outside like we did. Growing up, all the kids in my neighborhood were riding bikes and playing sandlot football. I didn’t want to go home, mainly because my dad would just give me a bunch of chores. Create outside projects because I’m sure there’s something that needs fixing or painting, do your own lawn work and gardening, chase your spouse or kids with a garden hose, help a neighbor, ride a bike. The list is endless to each individual’s situation. Watch the many testimonial videos, read success stories, and learn from the instructional video. Have fun creating a new body, and invite a friend to join in the partner techniques. The following instructional video will demonstrate proper handling, technique, and progression levels to help people of all ages and fitness levels. Order yours today, and start building a better stronger body! 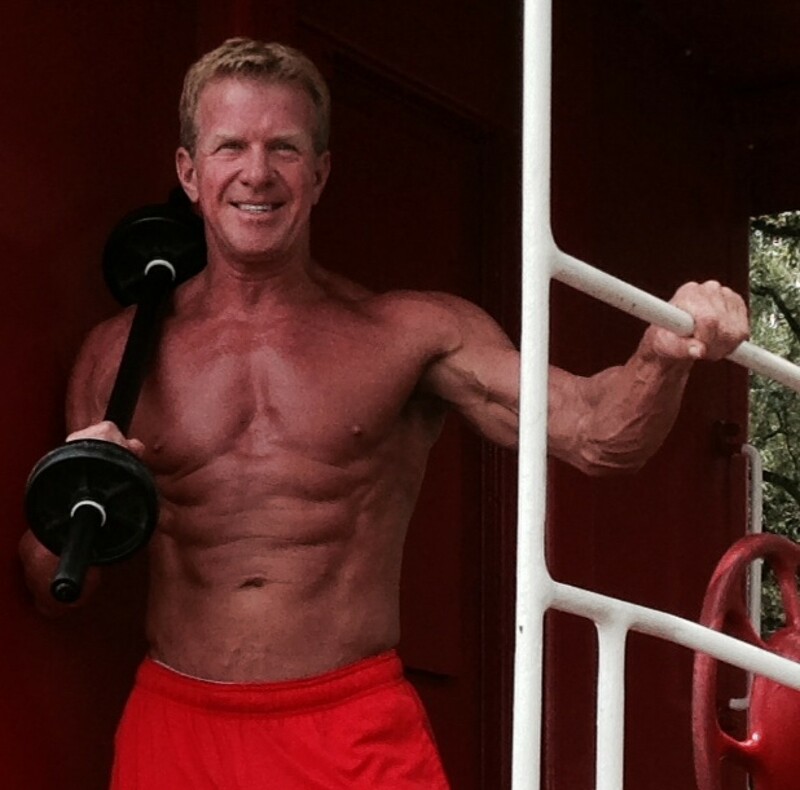 I have several friends who are competitive body builders, fitness and figure professionals. It’s quite remarkable to watch them prepare for an upcoming competition show. The intensity, dedication and extreme diet they go through is almost indescribable. My friend Frances Field, NPC Figure Champion, happened to be training and preparing in the gym recently. I typically strike up a conversation with Frances and her husband, but that day was not the day. She would have eaten me up. Frances was frantically performing speed drills on different cardio machines, then sprinted through the gym, followed by push-ups and jumping jacks, then sprinted back to the cardio machines, only to repeat the process over and over. Her intensity, made me think about my own workouts. I sometimes find myself just going through the motions, watching the clock, not putting in much effort and practically wasting my time. After observing Frances, I decided to kick up my intensity a few notches. I was lifting weights, so I added heavier weights with less rest in between sets. Within a few minutes, sweat was pouring out, my heart rate was up, the endorphins were kicking in, and I was feeling like Superman. Well, maybe more like Superman’s father. I am getting a little older, but you get my point. Next time you’re starting any type of exercise, try using competitive intensity, and psych yourself up with a purpose of accomplishing goals.